So begins the story of three sisters who find a whale stranded on a windswept beach and try to save it. 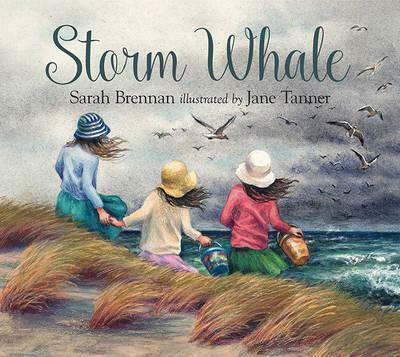 Storm Whale starts off on a windy day when three sisters walk into town and are confronted with the tragic sight of a beached whale. The girls valiantly spend the day bucketing water over the massive beast, until dusk and a storm drive them dejectedly back to their holiday home. What will the morning bring? Visually stunning and poetically stirring, Storm Whale represents the seaside world in all its imposing grandeur.